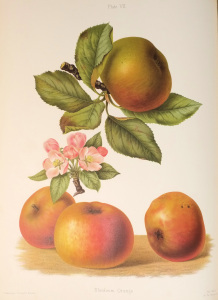 The Herefordshire Pomona, by Robert Hogg & Henry Graves Bull, was a 19th century monumental attempt to catalogue all the numerous traditional apples and pears that were grown at that time in the cider county of Herefordshire. The illustrations alone were undertaken over a period of eight years. 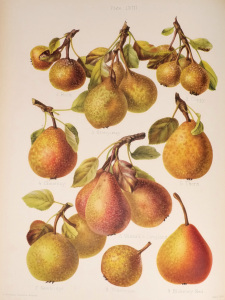 It was one of the first works to attempt to fully catalogue all the existing varieties of English fruit, and is generally regarded as a masterpiece of late 19th century natural history book production. Bound in two sumptous volumes in half green morocco, published between 1876-85, it includes 77 chromolithograph plates illustrating many examples. It is generally recognised that fewer than 600 copies were published. 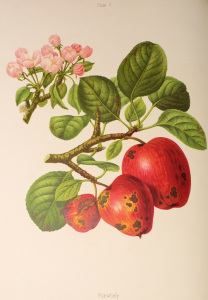 The copy in the natural history books section of our Antiquarian Book Sale on the 19th March 2014 is in fabulous condition and is conservatively estimated at £3,000-£4,500.